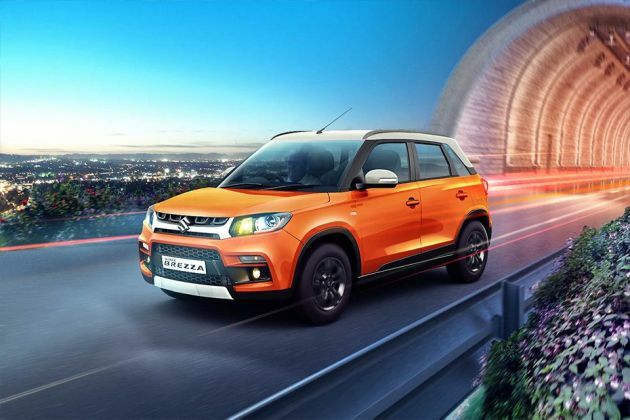 Maruti Vitara Brezza LDi is the entry level variant in the recently launched compact SUV series. This sub 4-meter SUV made its debut at the recent 2016 Auto Expo in New Delhi, where it had been the show-stopper for Maruti Suzuki. It took almost two years for the company to come out with its production version. Now, the car is officially available for sale here in India and it is placed against the likes of EcoSport and TUV300. This is perhaps the first time that Maruti Suzuki India Limited is venturing into the lucrative sub 4 meter SUV of the country. 1. Its fuel economy figures are rather decent. 2. It gets an audio system with CD player as standard. 1. There is no ABS with EBD for this variant. 2. Waiting period is insanely long. 1. The SUV comes with an advanced Suzuki's TECT body structure that reinforces its safety standards. 2. It comes with all essential comfort features including front power windows, music system and an AC unit. The Maruti Vitara Brezza LDI is the entry level variant that houses a 1.3-litre DDiS diesel engine under the hood. This engine is currently used in several popular Maruti models including Ciaz, Dzire, Baleno and the S Cross. It produces a power of 89bhp and a peak torque of 200Nm. Its exterior design is perhaps its biggest plus point, which is the reason why it is receiving great response among the masses. It has bold exterior design with beautiful curves that blends well with each other to make the SUV look stunning. We at CarDekho feel that Brezza looks far better than other compact vehicles available in its segment. Although, it is an entry level variant, it comes integrated with several important facilities including electrically adjustable ORVMs, keyless entry, a music system and manual air conditioning unit. The external appearance of Vitara Brezza is simply stunning and we got to admit that it’s like no other model in the Maruti's portfolio. Despite being a sub 4-meter SUV, it has a perfect SUV design philosophy unlike most compact SUVs of today. Its front facade gets a sleek, yet bold radiator grille with a thicker strip. Embedded in the center is the company's insignia that adds to the elegance. The headlight cluster surrounding the grille has a sleek yet bold appearance. It comes integrated with conventional brake lights. The front bumper is just massive featuring large air intake section and a lower cladding that renders a sporty character to the SUV. This vehicle has massive fenders by the sides with black colored wheel arch extensions. They have been mated with a set of steel rims covered with tubeless tyres. Its rear section also looks attractive. It has an attractive taillight cluster with split combination lamps. At present, the car maker is offering this latest SUV in five paint options including Pearl Arctic White, Blazing Red, Premium Silver, Cerulean Blue and Granite Grey. This SUV's interior design is a bit of disappointment for the customers. It is definitely a let-down, since the design lacks the modern touch. However, the fit and finish of the cabin along with quality of materials used inside brings some sort of up-market appeal. It comes with an all black color scheme with chrome inserts on AC vents. The steering wheel is the similar unit, which is used for Baleno and Swift Dzire. Its seating is surprisingly comfortable, thanks to its ergonomic design. It can offer comfortable seating space for two adults in the first row and three people in the second row. In terms of features, this base trim gets essentials including front power windows, central locking, a manual air conditioning system, electrically adjustable outside mirrors, tilt adjustable steering, multi-information display with trip meter and fuel level indicator. This base variant comes with a 1.3-litre DDiS 200 diesel engine, which is currently performing duties for other variants in the line-up. This motor has a displacement capacity of 1248cc featuring 4-cylinders and 16 valves. Based on a DOHC valve configuration, this motor comes integrated with common rail fuel injection technology. It churns out a maximum power of 89bhp at 4000rpm in combination with a peak torque of 200Nm at 1750rpm. Its transmission duties are being handled by a conventional five speed manual gearbox. The company claims that the vehicle can return a mileage of 24 kmpl (as per ARAI). This vehicle has a soft suspension featuring McPherson strut for its front axle and a torsion beam layout at rear. In addition to this, coil springs are loaded on both the axles which help in improving the dampening effect. This will certainly offer a comfortable driving experience to the occupants inside. In terms of braking, it gets front ventilated discs and rear drum brakes, a conventional braking system, which is used for many cars and SUVs. However, it misses out on some important features like ABD with EBD, which is unfortunate. Being the base variant, the machine comes with a limited list of features on the safety front. First, there is a driver's airbag that keeps the man behind the wheel safe. Along with this are facilities such as a driver's side seatbelt reminder lamp and buzz, a dual horn and a manual head-light leveling. It has been engineered on a Suzuki TECT body format that limits damage to the occupants in case of a mishap. An engine immobilizer solidifies all rounded protection, enabling security for the vehicle apart from just the occupants. In the end, the vehicle comes with its share of pros and cons. On the upside, the uniqueness of the vehicle's look, the reasonable comfort element within and its decent handling are sure to get people enthused. On the downside, however, there is lack of space within, the mediocre performance among other things might put people off. The vehicle captures its niche, and it definitely doesn't try to appease everyone at once. If you're the type that just wants a swanky, cool looking ride with a comfortable aura, then this is the ride for you. On the other hand, if you would prefer to have it all, then some other model would best suit you.